Ten-compartment tray—five each for coins and currency. Outside drawer has key lock. Bell rings when drawer is opened. 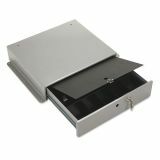 Removable plastic money tray has key locking cover. 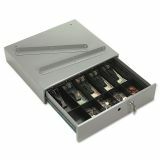 PM Company SecurIT Steel Cash Drawer w/Alarm Bell & 10 Compartments, Key Lock, Stone Gray - Cash drawer with alarm bell offers five coin and five currency compartments. Outside drawer features a key lock, and alarm bell sounds when quick release button opens the cash drawer. 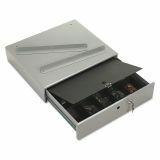 Removable plastic money tray has key locking cover. Includes mounting hardware and keys. Made of heavy gauge steel. 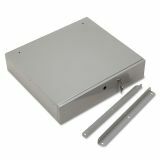 Includes one cash box, mounting hardware, two keys for outside drawer and money tray.